There are some days that only the ringing of the door bell can fix. Assuming the person on the other side of that door is holding a large brown bag full of an oil-drenched sodium bomb. No amount of justifying “but homemade is soooo much better – and better for you!” fixes those days. Carbs must be over-paid for. Then delivered outside of the promised window without the extra spicy mustard you specifically requested. And then consumed in excess, and far too fast. But on days when you don’t need the psychological effect of throwing your credit card at a stranger standing on your front step, homemade is so better. And better for you. Because there’s room in everyone’s kitchen for a take-out recipe that doesn’t come drenched in a 1/2 cup of oil. 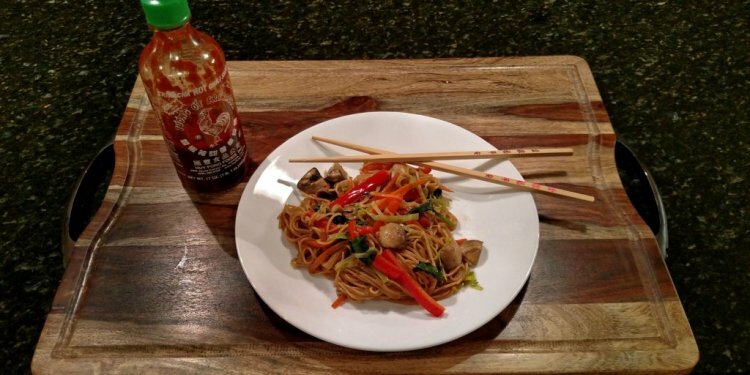 For the last 5 years, that bowl of DIY take-out Chicken Lo Mein has been the second-most popular noodle dish in this house. 5 years. The recipe comes courtesy of my friend Elly over at Elly Says Opa. Her blog is usually the place I visit when I’m short on ideas for our weekly menu. Also, it’s where I go when I want to look at dreamy photos of delicious Greek food that no one else in this house would eat with me. Well, at least not before I introduced them to the magicalness of gyro and baklava at Greek Fest… but that’s a different story and a different recipe. Today, it’s Chinese Food from my favorite Greek blogger. We make a few minor changes to the recipe. We don’t incite the natives to rebel by including mushrooms. And the open-bag-of-frozen-snap-peas-dump-in-pan keeps the littlest native from picking through her bowl of noodles looking for an offending chunk of celery or an icky chunk of carrot. (Because in typical 3 year old logic, carrots are awesome raw and carrots are awesome cooked to a mush in a can of soup. But she will cut you – and by “you” I mean “me” – over anything in between). And sometimes we add orange juice and strips of orange zest. And sometimes that orange becomes grapefruit. And when we can’t keep up with the red bell peppers from the garden, I throw in as many of those as I can squeeze into the pan. And as long as there’s no celery or mushrooms or carrots, everyone is happy. And stays happy. A lighter, better-for-you-than-takeout chicken lo mein. Cook the lo mein noodles according to package directions. Drain, toss with a few dashes of sesame oil, and set aside. In a small bowl, whisk the oyster sauce, soy, chicken stock, cornstarch, and red pepper until smooth; set aside. Heat the oil in a large skillet (I use a nonstick pan) over high heat. Stir fry the chicken for 3-4 minutes, until almost cooked through and add the ginger, onions, garlic, white and light green onion parts, and snow peas. Cook for another 2-3 minutes until the onions are cooked to your preference, stirring frequently. Whisk the sauce and add it to the pan, letting it boil for 1 minute before adding the noodles. Toss to coat, top with dark green onion slices, and serve.